Steam mops are a modern cleaning solution for busy people. They can be used on nearly any sealed floor material, including tiles, hardwoods, and laminates. Overall, these products are advertised as providing a deeper clean for flooring without the elbow grease or harsh chemicals required by mopping. Do they live up to the hype? It’s hard to tell when you’re shopping online. As fellow shoppers, we know how confusing it can be to shop for a new product. When we read user reviews, hundreds of people raved or ranted about the same model. That made us wonder–what’s the difference between a great product and a waste of money? We spent hours looking for the best models available. We looked for the best steam mops on the market, comparing dozens of models and keeping in mind different budget requirements, flooring types, and household messes (pets, kids, etc.) We compared features, specs, user reviews, and expert analysis from Consumer Reports, Good Housekeeping, and other publications. In the end, we’re confident that we’ve found a few solid choices that really do live up to the hype! It’s all about finding the right one for your individual floors. We’ll guide you through which features are best for each flooring type, and help you narrow down your search. We’ve selected a few top choices for wood floors and tile floors. A few of our choices are crossover mops, with attachments that let you use them as handheld cleaners all over your house. All of these options stand out for their smart design, powerful steam units, and durable materials. On this page, we’ve provided some quick overviews of all our favorite products. We’ll talk you through the basic features, and give you a general sense of what each is good for. To read our full, in-depth reviews, just click on the Read More link after any model! Below our steam mop reviews, we’ll introduce you to some of our other favorite cleaning machines which allow you to use steam on all sorts of surfaces, like kitchen countertops and bathroom fixtures! If you already know you want a more versatile steam cleaner that can handle projects above your floor, go ahead and skip to those reviews! Steam mops for wood floors have to be powerful enough to do a good job of cleaning, but adaptive and gentle enough to protect hardwoods. 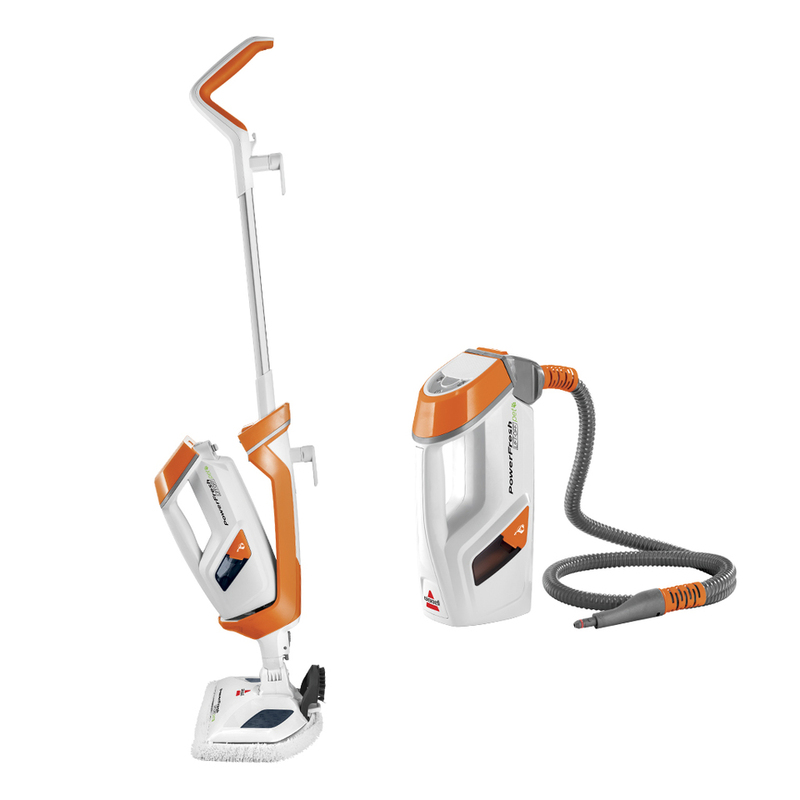 These models have adjustable steam levels, cushioned mop pads, and simple designs that we love for mopping hardwood floors. 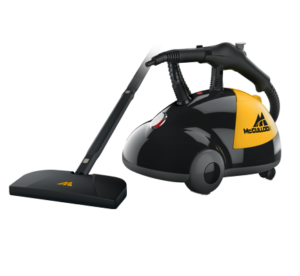 As long as your flooring materials are sealed and finished, any one of these cleaning machines will suit you well! 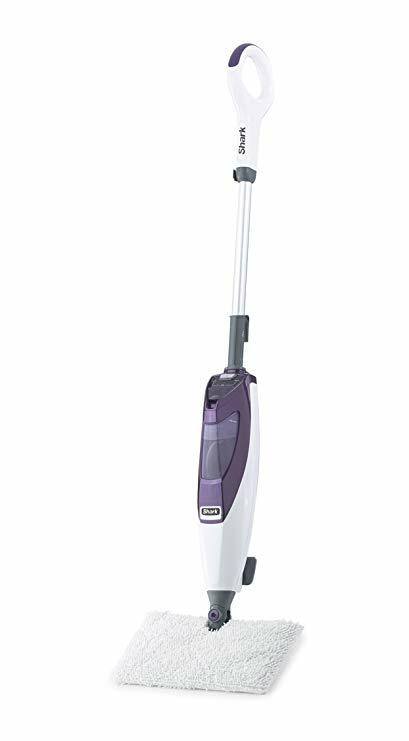 The Bissell PowerFresh is the top selling steam mop on Amazon. It’s very reasonably priced, and one of our least expensive recommendations. With a 3-setting control and two pads (scrubby and soft), it does a pretty good job on all flooring types. 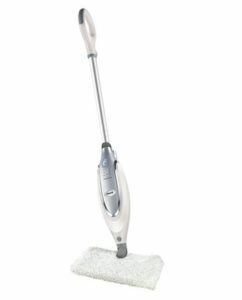 Bissell also uses smartly designed mop pads, which wrap around the mop head with a clipless design. The microfiber fabric also uses integrated Microban technology, for additional antibacterial properties. The padded microfiber cloths are great for wood floors. They’re soft enough to protect your floor’s finish, while the microfiber actually polishes the wood as you go! It’s a bit more versatile than the average offering, since it comes with a scrubber brush and special scrubbing mop pad for working on tiles. It’s a good choice if you have a variety of flooring types and want to clean them cheaply. The Bissell also ties with the Reliable for the longest power cord of any of our recommendations, at 23 feet long. Since it’s so popular, there’s plenty of user feedback on the online marketplace. This has given Bissell time and incentive to address a few early issues with the PowerFresh. While early versions of this model had mixed reliability, recent reviews suggest that quality control has improved. The biggest selling point on this Shark is its versatility. Its mop head flips over, so you can use both sides of your pad! Plus, you can customize the steam settings to your specific flooring type and the mess at hand. It’s suitable for both hardwoods and tile. We especially love the coverage you can get with this. 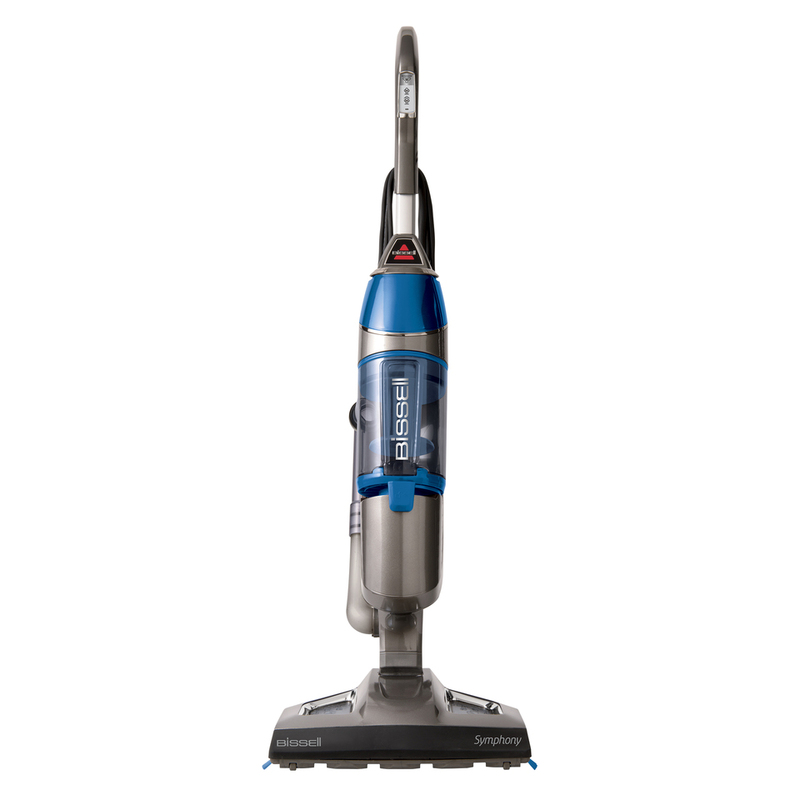 The Shark’s mop head has a much larger footprint than the competition, at a full 12″. It also has a larger water tank to match. So, you can cover lots of ground quickly, without refills! The mop head comes with two sets of pads, so you can cycle them through your laundry. The mop pads are also unique in that they’re double-sided. That means they’ll cover twice as much ground in a cleaning session. In short, you’re saving time and money! This one is built to last, with a metal wand and sturdy construction. It’s not as rock-solid as the Reliable, but it’s a lot better than the Bissell! The steam is adjustable, so you can turn it down to protect your finishes and turn it up to remove tough stains. While it’s not as effective as the Bissell on tile, its rag-mop style cloths do a decent job of cleaning in between tiles. The Reliable Steamboy is our top quality choice for wood flooring. It’s perfectly equipped for cleaning hardwoods of all sorts. Its mop pads are highly cushioned, and wrap around the mop head to protect the molding around your floors, as well as the floors themselves. The mop head is also triangular, which helps you clean into corners much better than a traditional rectangle. One of the best things about the Reliable is that it gets hotter than other steam mops. It comes from a company that also makes big canister systems, and they’ve clearly carried some of that expertise over! The super-hot steam ends up leaving less moisture behind, which is good news for your hardwoods! You won’t end up with streaks or puddles. We can’t say enough about the Reliable. It’s very ergonomic, easy to use, and leaves very little moisture behind. It also comes with a glider attachment for refreshing and spot-cleaning carpets. It has an impeccable record for durability, and comes with a 1-year warranty. Shark’s new Genius mop is one of our absolute favorites right now. It’s particularly impressive when you realize how inexpensive it is! We’re currently recommending it as our most affordable solution for tile floors. There are lots of reasons to love the Genius! The first is the pads on this one, which are really stellar. For people like us, who geek out over the weave and texture of mop pads, they’re a dream! The Genius pads have lots of nap, which is what we look for to clean into the grout between tiles. They also have these grippy rows sewn in, which work like those Rubbermaid cleaning cloths. They scrub the surface as you move the head, so you don’t have to keep running back and forth over the same area. We’re also massive fans of the new steam spray feature that Shark has built into the Genius. We hope it makes its way into the rest of their mops! Most other mops with “spray” features blast steam from the whole pad. It does help get into grout, but it also starts to get messy fast. This one targets a spray to one specific area, so you can tackle a problem spot without making puddles! Score! The Bissell Lift-Off Pet is our top quality recommendation for tile floors. We love it for its tile scrubbing abilities and long warranty. The mop head is equipped with a snap-on scrubber brush, which is perfect for reaching into grout, as well as scraping off tough spots like crusted food or gum. It also comes with special scrubbing pads. All the mop pads stretch to fit over the head, so you don’t have to use any clips, catches, or brackets. These parts are often delicate and annoying, so that’s a plus for us! It’s also very versatile. The Lift-Off features lets you make full use of a 13-piece attachment set, and provides plenty of power to back them up. It’s also one of the only options with a padded fabric attachment for upholstery and curtains. Because it has adjustable steam, it’s also suitable for wood floors! The Bissell’s warranty is extra long, at 2 years. That’s at the high end of warranty coverage for this kind of product. Reviewers had very few complaints about this updated model. It’s more powerful and more durable than its predecessor. Plus, there are intelligent new features like stain removal, steam alert lights, and odor removal with Febreze scent discs! This Shark features both a normal mode, and a pressurized “Blast” mode. You can also combine the two for full-blast on tough tile and grout. Steam levels are controlled automatically, so you always have a base layer of moisture to help the mop glide easily along floors. Then, you can turn on the spray mode to amp up the cleaning. The blasting mode is great for sanitizing areas with deeper grout, since it reaches deep into crevices to kill hidden bacteria that you can’t reach with other mops. This one also comes with a dedicated scrubbing cloth for tough messes. You can use it for the tricky bits, then swap out for the standard pocket to protect your hardwoods. You can also sanitize and spot clean above floor level, using the attachment nozzle and extension hose. It’s hard to beat this thing for versatility! The Shark Blast and Scrub uses the same wide, double-sided pocket mop design as the Professional model we’ve recommended for hardwoods. 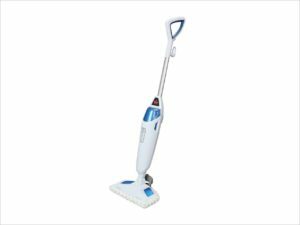 You can clean with both sides of the mop head, and cover lots of ground with the 12″ floor attachment. To begin with, steam is a natural cleaning whiz. If you’ve ever seen a detective movie where the ace investigator uses steam to open envelopes, you can already see why! Instead of requiring chemical solvents, the mix of super-hot water and air dissolves sticky adhesives and other messy compounds in a jiffy. So, rather than having to use soaps or other nasty mopping chemicals, you just use water and heat! In most cases, steam does an even better job! With a base layer of steam keeping the mop pad wet, these mops eliminate a lot of the friction you encounter with a traditional stick mop. The mop head glides along the floor, loosening dirt with steam and heat rather than relying on scrubbing. You can hover over a spot to give it more steam, and then gently scrub away the spot. These also have cloth pads, like a normal mop. They’re generally a bit more sophisticated than the manual version, and are made from microfiber or chamois. Some pads also integrate anti-bacterial coatings to help trap and kill bacteria. You can wash and reuse mop pads for a variable amount of time, depending on the company. Basically, any sealed floor surface. These are an effective tool in your cleaning arsenal for laminates, tiles, hardwoods, and pretty much any other flooring you can think of. They’re not designed to clean whole carpets, although some models have attachments for spot treatment and “refreshing” small areas. Some models include “lift-away” or “lift-off” features. This lets you use the unit without the wand or mop head. 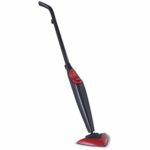 It gives you a basic handheld steam cleaner, which you can use with the included attachments for surfaces like countertops, plumbing, and kitchen appliances. These attachment sets are generally pretty good, but they’re not as heavy-duty as a full-sized canister cleaner. Expect them to do a decent job for light cleaning and maintenance on most surfaces. Also, some aren’t as powerful in the handheld mode. Why are they better than a traditional mop and bucket? These use pressurized, high temperature steam to sanitize flooring surfaces, killing harmful bacteria and biological matter, and reducing residual bacteria and mold in cracks of tile floors. This type of soap-less cleaning saves you money, since you won’t have to buy cleaners. It’s also a safer, more eco-friendly way to clean your floors. They’re a powerful tool for chemical-free cleaning. Because they don’t use any harmful chemical cleaners, eco-minded consumers can rest easy while still cleaning with maximum effectiveness. Steam also reduces exposure to allergens in cleaners, and eliminates the risk of your pet ingesting toxic chemicals. These don’t rely on a bucket of water, which can get dirty as you clean and leave streaks and muddy spots on the floor. You won’t have to deal with your mop water cooling as you clean, and you’ll always have full heat for breaking down stains and dried spills. You’ll also be leaving a lot less moisture behind. You won’t have to use nearly as much elbow grease. Steam dissolves or loosens pretty much any floor mess, so you’ll just have to keep moving the mop head back and forth to wipe things away. How do I know if my floor is sealed? If you’re not sure if your floor is sealed, there’s a good chance it isn’t. Linoleum and laminates are usually a safe bet for steam mopping, as are new tile and hardwood flooring. Older tile can develop cracks along the grout, or pockmarks in the sealant. Older hardwoods frequently have cracks between boards, which can let moisture seep into the base of the flooring. Make sure you check your floor’s warranty, or get someone who knows what to look for to double check for you. What can happen if my floors aren’t sealed? Wood floors can warp and buckle. Without the proper sealant, these mops can also mar or destroy the finish of the wood. With tile floors, water can seep between tiles and create mold in the floor support beams and cushion. Even if floors are sealed, they’re not necessarily designed to be cleaned with a steam mop. Some finishes can be destroyed or removed by this kind of cleaning, so please check your manual or call the installer first if you’re not sure. Why are there so many mixed reviews for steam mops online? We found that a good many of the negative reviews on our choices came from people who didn’t follow the user manuals, or had unrealistic expectations about what these products could actually do. Often, complaints were due to people using tap water, or trying to mix soaps into the tank. Other problems were due to running the tank on empty, or treating it roughly, using it like a traditional stick mop. Other issues mentioned in some reviews are from older incarnations of these models, and have since been recognized and addressed by the manufacturer. We’ve pointed out specific examples of those in our in-depth reviews. We can’t stress enough how important it is to follow the provided instructions. Beyond that, it seems like a given that you’ll have to treat it with care. They’re not industrial, and are more finicky than a vacuum cleaner or other machine. Take your time, and let the steam do the work for you. With that said, almost all steam mops are fairly temperamental. They’re a newer technology, and are still improving. Some of them have weak points, like mop cloth clips or poorly designed tank clasps. We’ve avoided those as much as possible, to minimize delicate breakage points. We also tried to find products with at least 1-2 years of warranty coverage. We put in extra effort to find superior options that have minimal risks of breakage or faulty parts. We chose the models with the least negative reviews. And we put the extra time in to read all the user reviews to see if there are really serious issues with our recommendations. We’re confident that our choices are more reliable and more effective than their competition. Take your time, and let the steam do the work for you. If a spot doesn’t come clean, just give it some more steam. Don’t apply too much pressure when you scrub. That puts stress on it, and defeats the purpose of the unit. It’s really important to use filtered/distilled water. Even if you have great water filtration at home, the slightest mineral content can build up and clog delicate parts in the unit. Also, make sure you follow the manufacturer’s guidelines for how to clean each surface. Each one has its own quirks, so it’s worth taking the time to get to know them before you start cleaning. Read more on what not to do with a floor steam mop. These can do some pretty deep cleaning, but it’s not an industrial solution for really heavy, accumulated messes. If your floors have a lot more than just surface stains or spots, you might want to look at a heavier-duty canister cleaner. These have attachments for floors, and a lot more power. You really do want to be sure that your floors can be steam mopped. Check the warranties, and test a small area of the floor to be extra safe. If there’s loose dirt on your floors when you’re mopping, that clogs up the mop cloth and means you’ll get less cleaning time out of it. Loose dirt and pet hair should be vacuumed first, so you’re just using a mop for the really tough stuff. The Symphony vacuums and mops at the same time, so you don’t have to clean your floor twice! This combo machine is great for any smooth tile or wood floors. Both features are simple and easy to use. They’re also kept separate by design, so you won’t be vacuuming up moisture, and you won’t be mopping up any dirt. To see our full review of it, along with other combination and hybrid cleaners, click HERE. Note: The best steam mop so far, considering the quality, price, and popularity, in our opinion, is the O-Cedar. These are a convenient, portable option for tackling small jobs around the house. You can use handheld cleaners on pretty much everything you’d use a full size cleaner on. They have attachments for grout, windows, counters, grills, and more! Some higher-end models have padded fabric attachments and upholstery tools, as well as large brush sets. The difference between handheld cleaners and canister systems is mainly a matter of scale. While they won’t work for deep cleaning jobs or whole rooms, handheld cleaners give you most of the same features as a full size system for a fraction of the price! They take less time to set up and take down, and take up far less space in the closet. 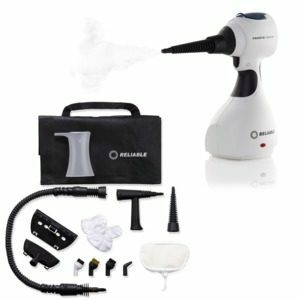 This high-end handheld steamer comes with heavier duty attachments than other brands, and is built much more sturdily overall. It comes with metal brushes, a stainless steel boiler, and a deluxe fabric attachment. The unit pumps out 48-bar steam pressure–as much as most canister systems! We’re also super impressed with the warranty coverage from Reliable, who insures everything for 1 year, and covers the boiler for life! While the Pronto is certainly an investment, it’s a really impressive handheld cleaner. Read our full review, and see our Best Handheld Steam Cleaner Reviews! For tougher jobs, as well as larger projects, a canister cleaner system is your best bet. They can handle most floors, with extra-large attachments. They’ve also got more power and pressure than a mop, so they’re great for deep cleaning tile floors and grout. You can even use a canister system on concrete walks and garage floors! In addition to the floor heads, canister systems sport larger, heavier-duty versions of the attachments sold with handheld systems. And unlike handheld systems, they really do have the power to clean grills, car parts, hard water deposits, and built-up kitchen grease. This canister cleaner pumps out 48-psi, and has an extra-large tank capable of providing 45 minutes of cleaning time. The trigger has a lock function, so you can have constant steam without holding your finger down the whole time. The attachment set includes extension wands, a mop head with microfiber cloths, and plenty of brushes and bristles to clean the rest of your house. The McCullough is a powerful solution for windows, floors, appliances, and pretty much everywhere else in your house or car. 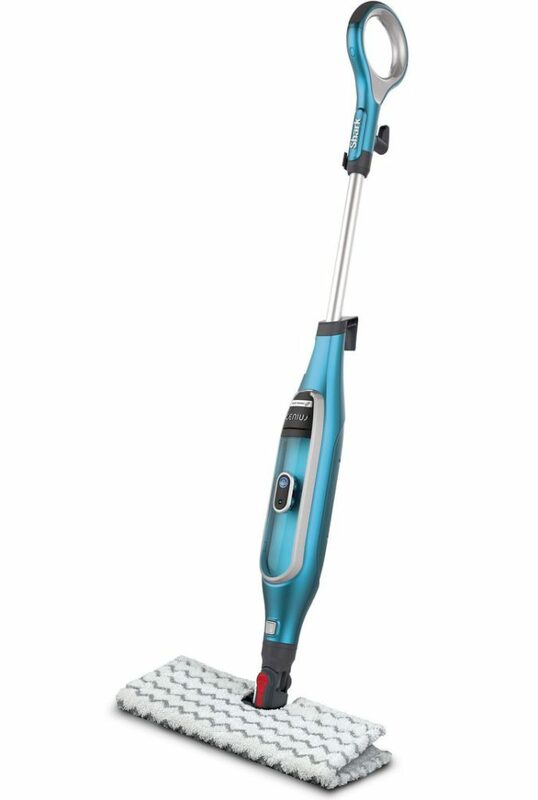 The best part is the price–it costs about the same as a steam mop, but covers a lot more ground! Our special guide to canister-style steam cleaners takes you through everything you need to know about these all-purpose cleaning machines. We’ll talk about what they work well for, how they measure up to steam mops, and why we think you should own one. Check it out! Aside from spot-treatment, steam mops aren’t your best tool for addressing carpet issues. That’s where carpet cleaners come in! We’ve reviewed a few of our favorites in this dedicated guide. It answers all your questions about carpet cleaning machines, and shows you lots of options, from compact household units to heavy-duty machines that are ideal for homes with all-carpeted flooring. You’ll find it all here. This special guide focuses on all the do’s and don’ts of shopping for a steam mop when you’ve got hardwood floors. We’ll discuss which types of hardwoods can handle steam, and which not to touch. We’ll also talk through the features that make a model better or worse for hardwoods, and talk about what to do when you’ve got a mixture of flooring. So, if you’ve got hardwoods to clean, read on! Likewise, we’ve put together a guide specifically for tile and laminate flooring! In this guide, we talk about all the features you should look for to clean tiles of all sorts, and deal with grout too! There are lots of exciting options, so check it all out now! When you need extra power for cleaning floors and a mop won’t cut it, you need a floor steam cleaner. We’ll talk about the differences between steam mops and floor steam cleaners in this guide. We’ve also reviewed a few of our favorites, so you can get a sense of which one would be the best for your home. Looking for other products that help you keep your home or office clean with minimal work? Check out our review of the best robotic window cleaners on the market today. These great products have come a long way in the last decade or so since becoming mainstream, and one or two can make short work of even the dirtiest windows completely autonomously. We look at five of the best robot window cleaners and cover their pros and cons.